I took my mum to Pizza Express in Preston for a birthday lunch today, we had a lovely lunch and a good chat! The service was friendly and unobtrusive, and the surroundings, although a little noisy when it’s busy, were pleasant enough. I’ve tried the pianta pizza before, in the Blackpool branch, when A and I had been desperately searching for somewhere in Blackpool that we could eat which had something gluten free and vegan. I know, we’re asking a lot here… Blackpool is a tourist town, so the restaurants tend to be geared towards the more populist end of the scale, that’s not to say there isn’t good food available, but it does tend to be of a certain type. 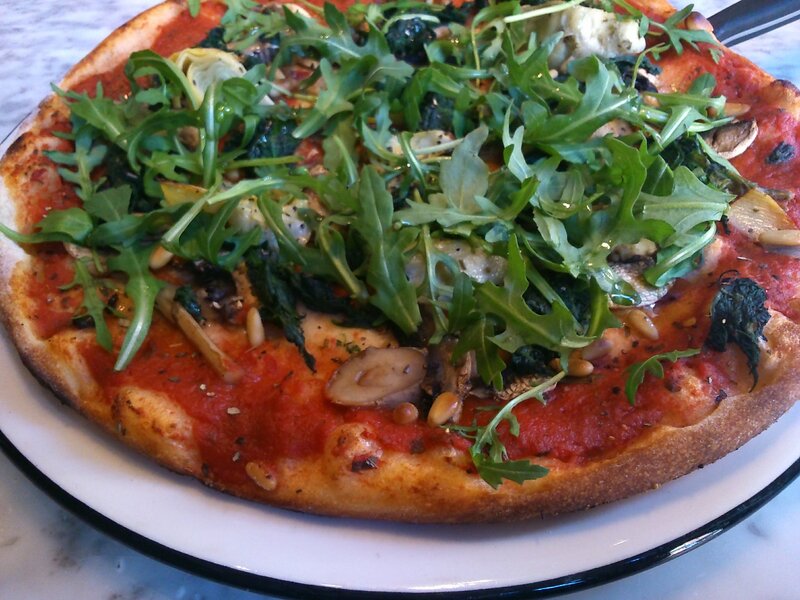 We chose Pizza Express in the end, because as well as offering a vegan pizza, they also do a gluten free base, yay! And, happily, a gluten free lager too. The Pianta is topped with arrabbiata sauce, artichokes, spinach, chestnut mushrooms and pine nuts. With fresh rocket strewn over the top too. It’s a great combination, the mushrooms are juicy, the artichokes come in nice big tasty chunks, the spinach is a good texture, and the pine nuts that have toasted to golden in the heat of the oven top it off nicely. Today I tried it with the classic base, which is decent, with a nice chew. The gluten free base that A and I both had on the previous visit, as these things tend to be, is a little brittle. Don’t try to cut it with a knife, you risk it shooting off on to the next door table! Break it into pieces is my advice, you’ll be able to eat it in a much more seemly fashion! But it has a good flavour, and holds the toppings well. On the Blackpool visit, we also tried the Leggera superfood salad which they were happy to serve without the mozzarella. Now this was great, it includes baby spinach, beetroot, roasted butternut squash, avocado, pine nuts, cucumber, basil and a balsamic dressing. We’ve been meaning to recreate this salad, it’s a delicious combination! It’s worth noting also, that as well as making us the salad without mozzarella at the Blackpool branch, the Preston branch today showed great awareness of their customers food preferences. I had a bruschetta as a starter, and asked for it without the pesto, and as my mum’s pizza included pesto they served it in a bowl on the side, demonstrating nicely that they’d paid attention to the order as a whole.